Usually we use our great banca which offers room for about 15 – 20 divers to go on the big trips. We distinguish between day trips and multi-day trips which include additional overnight stays in local resorts. 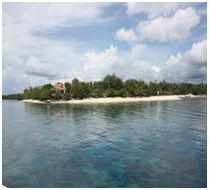 The Dive Spots for our trips are: Cabilao, Sumilon, Caceres Reef (offered as day trips) as well as Siquijor and Pamilacan (multi-day trips). Multi-day trips are individually planned and will only be available if there are enough interested participants among the divers. Cabilao Island is located between the islands of Bohol and Cebu. It is a little island that offers so much beauty. The main reason to visit Cabilao is the opportunity to dive in the wonderful reefs and look out for its famous hammerhead sharks. There used to be regular sightings of these wonderful creatures during specific seasons. However, nowadays sightings are unfortunately rare which makes the experience even more unforgettable. Sumilon Island is not only known for whale shark sightings but various rays as well as black and white tip sharks. Sumilon Island is a fascinating discovery for nature lovers. It is the country’s first marine reserve, and its preservation is of the highest priority. It is surrounded by crystal clear waters and has great vegetation, an untouched lake, a great white sand bank and one of the best diving spots of the Visayas. 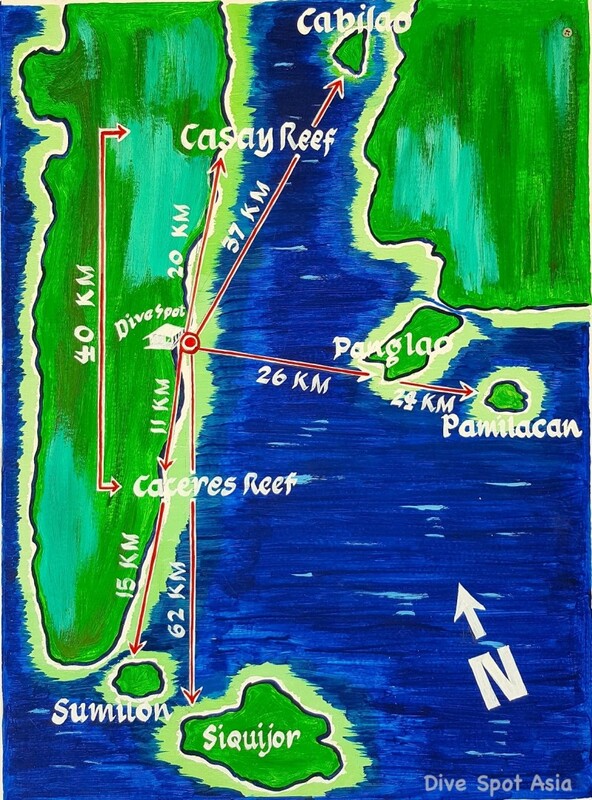 Caceres Reef is a shoal, which means it is a reef completely under water all the time. This dive spot also is a target for halfday trips due to a travel time of just 30 minutes. Caceres is an example for the power of nature. In 2012 taifun Pablo destroyed nearly 80% of the reef, but today it is once again one of the nicest spots and a MUST dive during your stay. Since we do NOT visit the feeded whalesharks of Oslob, Caceres also is a great alternative that features occasional natural sightings of these gentle giants. From XL to XS Caceres offers a wide variety of the Philippine underwater life. Siquijor, the most fabled island of the Philippines. Here we will stay overnight at a very nice resort and explore the underwater world of the island for a few days. Although the time of witches and wizards has long been gone, in Siquijor, also known as the Mystic Island, these age-old legends are still very much alive. Siquijor is the third smallest province in the Philippines and for a time it belonged to Negros Oriental. 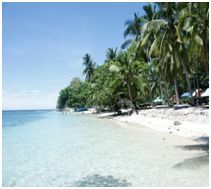 In the past Siquijor was also known as the “Island of Fire”. The 102 kilometers long coastline of this beautiful small island has white sandy beaches and it is said that witches, magicians and shamans live there. Some superstitious Filipinos prefer not to stay overnight due this legend, however, doesn’t this sound like an adventure? Siquijor is indeed a beautiful and mysterious island. Pamilacan means “resting place of the mantas” in the vernacular. After a night on Bohol we will start early in the morning to watch whales and dolphins. After that and with a little bit of luck you may be able to meet one of the eponymous giants of the island under water. Catering during the trips includes snacks (sweet buns, coffee, tea and drinking water) or breakfast and a freshly prepared BBQ with the freshest fish, meat and side dishes like vegetables, rice and salad. Snacks are included in the day trip price. The BBQ is prepared upon request and billed separately. Soft drinks and drinking water are free of charge. Up to 3 dives with a dive time limitation of 60 minutes per dive can be performed during day trips.